In the meantime, here is a WIP I haven't uploaded yet! Finished the WIP I posted, and it's a remake of an old drawing-so here's a before and after! Man! These look great. It's great to have a fresh artist around showing off their work. The coloration is right on the money and I like the expressiveness of the faces. 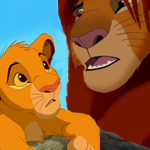 Checked out your album, and especially the recent ones of Scar and of Simba with Timon both look great. How long does a drawing usually take you? wow, I love how you drew Muffy and Taka (young Scar) shading and background are also welldone! I will check your tlkfaa gallery!